The Cyclones got their second top-five upset in program history. Both happened this month. But their success may not help the Big 12's playoff hopes. Iowa State beats TCU and now has more wins vs. Top 5 opponents this month than it had in the history of its program before this month. 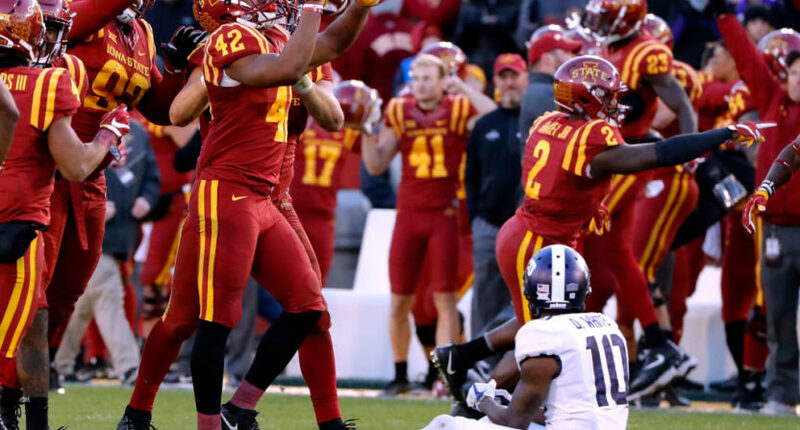 This one was a big defensive effort for Iowa State, as they held TCU quarterback Kenny Hill to just 12 completions on 25 attempts for 135 yards with no touchdowns and two interceptions. On the season, Hill had been averaging 228 passing yards per game with a 73 per cent completion rate. Cyclones’ defenders Marcel Spears Jr. and Brian Peavy both picked him off Saturday, though, with Peavy adding a 70-yard return and Spears Jr. notching the game-ending pick (which he’s seen celebrating above.) And Iowa State got enough offensive production to succeed, with quarterback Kyle Kempt completing 21 of 35 passes for 202 yards and two touchdowns (with one interception) and David Montgomery rushing 25 times for 74 yards. The Cyclones have made some pretty notable progress since head coach Matt Campbell came in at the end of the 2015 season, replacing Paul Rhoads. They were 3-9 in Rhoads’ final season and 3-9 in Campbell’s first season, but are 6-2 now, much closer to the impressive records Campbell posted at his previous stop, Toledo. (The Rockets went 1-0, 9-4, 7-5 and 9-2 in Campbell’s tenure.) And that’s already sparked rumors that a bigger program may try and poach Campbell soon. For now, though, Iowa State is thriving. Their success may not wind up being all that great for the Big 12, though. The conference now has no undefeated teams, with two teams at 7-1 (TCU and No. 11 Oklahoma State) and a third one at 6-1 and currently in action (No. 10 Oklahoma, playing Texas Tech tonight). Oklahoma and Oklahoma State face off in Bedlam next week, and TCU will play Oklahoma in two weeks, so there are still opportunities for big wins, but there are still three undefeated teams out there (Alabama, Georgia and Wisconsin), and a bunch of one-loss teams that may wind up ranked higher than the Big 12’s teams. And Iowa State has played a major role in that with their wins over the Sooners and Horned Frogs. A lot can still happen before the College Football Playoff field is fully determined, but while this season is certainly a good one for Iowa State football, it may be remembered as a costly one for the Big 12.